The Supreme Court's decisions on constitutional rights are well known and much talked about. But individuals who want to defend those rights need something else as well: access to courts that can rule on their complaints. And on matters of access, the Court's record over the past generation has been almost uniformly hostile to the enforcement of individual citizens' constitutional rights. The Court has restricted who has standing to sue, expanded the immunity of governments and government workers, limited the kinds of cases the federal courts can hear, and restricted the right of habeas corpus. 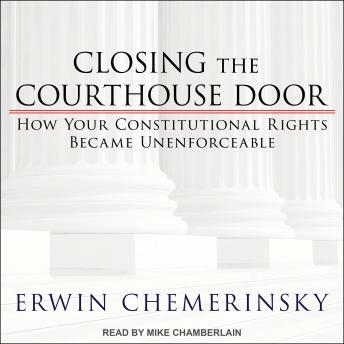 Closing the Courthouse Door, by the distinguished legal scholar Erwin Chemerinsky, is the first book to show the effect of these decisions: taken together, they add up to a growing limitation on citizens' ability to defend their rights under the Constitution. Using many stories of people whose rights have been trampled yet who had no legal recourse, Chemerinsky argues that enforcing the Constitution should be the federal courts' primary purpose, and they should not be barred from considering any constitutional question.